RankWYZ is an relative young automated blogging software which is capable of managing an unlimited amount of blog- or social-accounts. 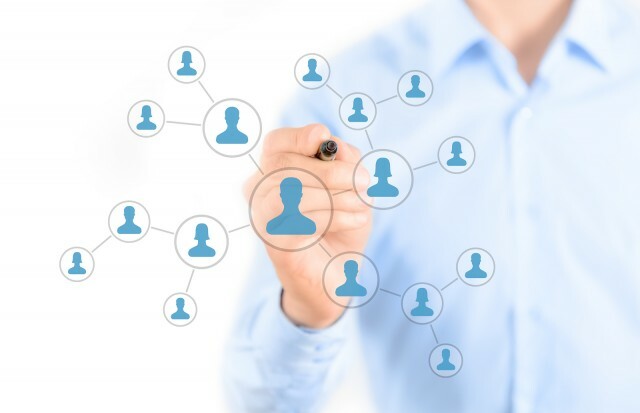 All of your social- and blog accounts are organized in networks. Similar to how files are stored in folders. With RANKwyz you can post to an entire network, which can have a numerous social- or blog accounts in it. Depending on the plan you choose, you get integrated pinging, indexing, backlinking services, captcha solving and more. RANKwyz was founded by Pavel Kovalev in Ontario, Canada in March 2012. The web based service was designed for bloggers, and agencies with a large amount of blogs or backlinking strategies. There are three price plans RANKwyz is offering: Wyzard, WyzardPRO and AgencyWyzard. 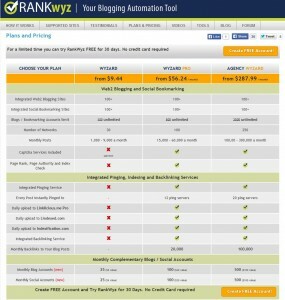 For a limited time RankWyz is offering a FREE for 30 day-trial! No credit card required. NEW: Now ALL plans can manage unlimited blog / bookmarking accounts! All plans come with 100+ blog- and 100+ social-bookmark sites to start with. Price for the Wyzard is starting at $9.44 per month. With this plan you can create up to 30 networks. 100+ blog- and 100+ social-bookmark sites are included and should be more than enough to start. In addition to that you get every month another 25 fresh blog and 25 new social accounts. This plan has an account limit of 100 accounts NEW: unlimited accounts! 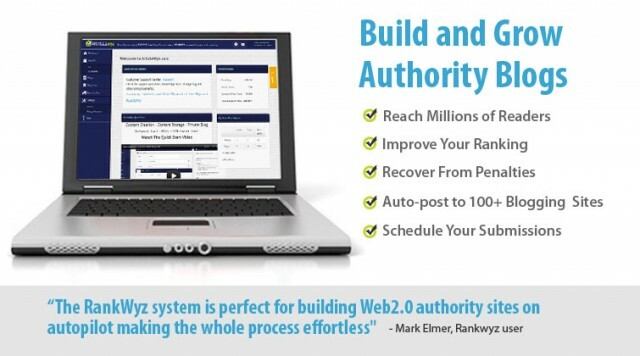 With the Wyzard plan you can publish 1,000-9,000 posts a month. If you need more accounts and don’t want to stress with their Account Creator you can get an extra 25 blog or social accounts for extra $5 a pack. Their built-in Captcha solving service is NOT included with this plan. But you can connect 3rd party integration like DeathByCaptcha. Price for the WyzardPRO is starting at $56.24 per month. With this plan you can create up to 100 networks. As with all Plans 100+ blog- and 100+ social-bookmark sites are included. Account Limit: 500 accounts NEW: unlimited accounts! Every month you get another 100 fresh blog and 100 new social accounts. Which has a value of $20 a pack. You can publish up to 15,000-60,000 posts a month. Captcha service is included and you can even use the built-in Page Rank, Page Authority and Index Check. Every month you get 20,000 backlinks to your blog posts on top. Price for the AgencyWyzard is starting at $287.99 per month. With this plan you can create up to 250 networks to organize your 100+ integrated blog- and 100+ social-bookmark sites. This plan has an account limit of 2500 accounts NEW: unlimited accounts! 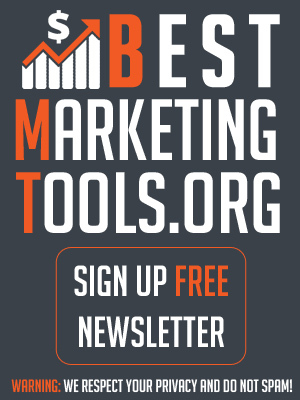 Every month you’ll get 500 fresh blog- and 500 new social accounts. They have a value of $100 a pack. You can publish up to 100,000-300,000 posts a month. Captcha service is included and you can also use the built-in Page Rank, Page Authority and Index Check. Every post gets instantly pinged to 20 servers. 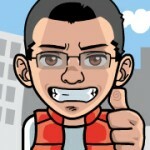 There are daily uploads to Linklicious.me Pro, Lindexed.com and Indexification.com. Every month you get 100,000 backlinks to your blog posts on top. Try RankWyz FREE for 30 days. No credit card required. – FCS Networker is a great alternative with very similar features. A big plus is that FCS Networker has a lifetime license available. – The Hoth – Let SEO-experts take care of the whole process of building your backlink profile. Give them your keywords and urls. That’s it. They’ll write and distribute the content (with backlinks) for you. If you found a free alternative please write in the comment section below. Summary : Great tool to create backlinks on autopilot! 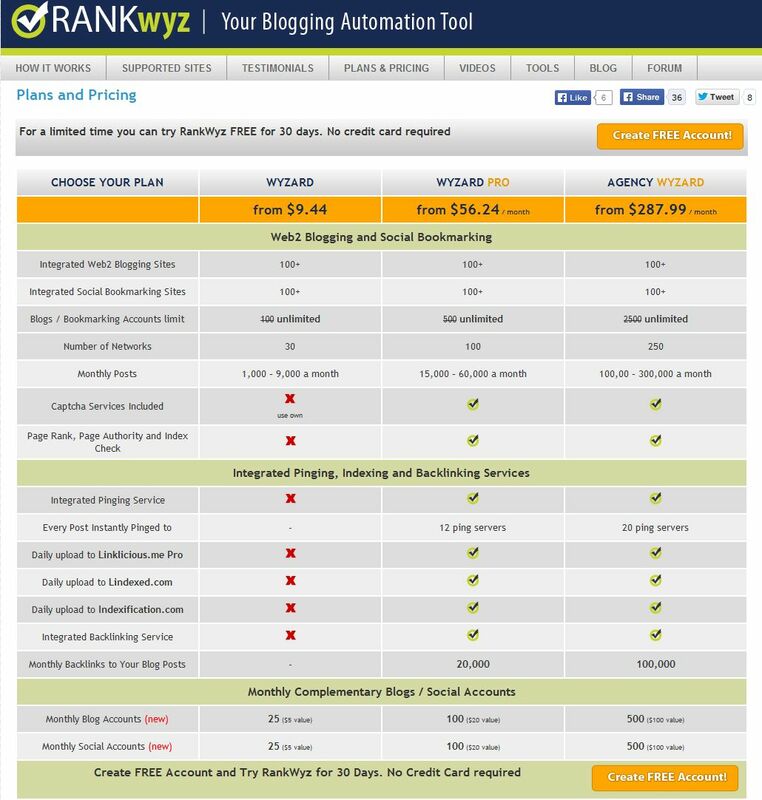 For a limited time you can try RankWyz FREE for 30 days. No credit card required. Previous: How-To Manually Install latest WordPress in under 60 seconds!